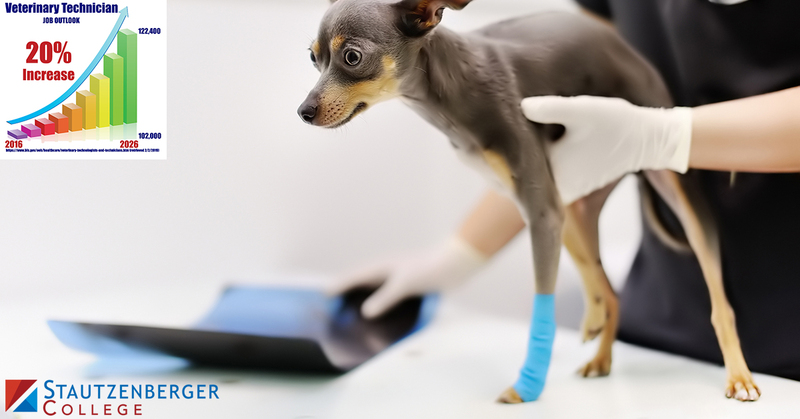 Every good veterinary technician strives to improve animals' health. Sydnie Nordin, recent Stautzenberger College graduate, went a step further by prioritizing animals' health over her own. However, Ms. Nordin soon suffered an injury. “I did break my right arm in the second to last term in my program,” she says. Whereas many would take time to rest, Ms. Nordin was so determined that she continued her work anyway. “It was very challenging, but I did pass the quarter with the required number of blood draws and catheter placements.” She then completed her externship at Temperance Animal Hospital and graduated from the veterinary technician program in December of 2018. She is thankful that she did not allow breaking her arm to set her back as she now enjoys the career she has always wanted. We hope Ms. Nordin's story inspired you. Whether you are interested in the veterinary technician program or one of the many other programs offered at Stautzenberger College, please come in and talk to us today to find your career passion. Call 888.859.8225 or submit our Request Information form to learn more.